The Eisriesenwelt is the largest accessible ice cave in the world. It is located in the Austrian Alps, near the town Werfen , in the mountain Hochkogel, which is 2281 m high. The complex of caves and tunnels, which is the world's biggest ice cave is sometimes referred to as the World of the Ice Giants in Werfen . If you are looking for a different thrill with the most astounding natural scenery that you can find, the Eisriesenwelt Caves in Werfen, Austria will capture your heart as an amazing limestone ice cave. The cave would provide you one of the most thrilling experiences during your Austria visit. 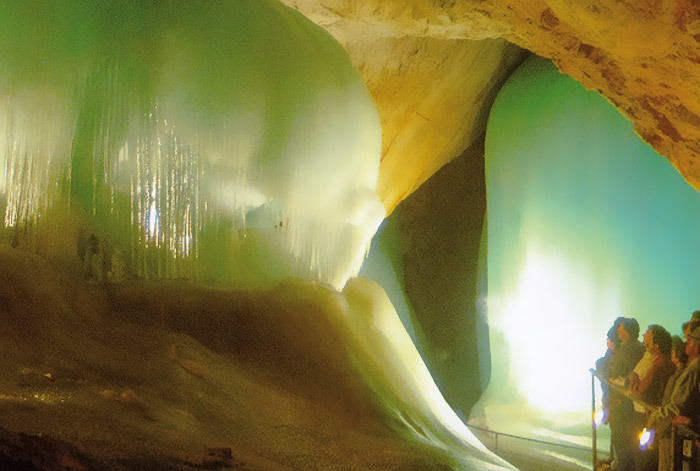 In Eisriesenwelt Caves, the ice remain frozen throughout the year. 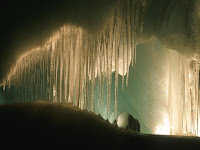 The ice cave is located at the height of 1640 metre. Usually the temperature remains under zero, so make sure to be prepared to save yourself from the cutting cold. The Eisriesenwelt (German for "World of the Ice Giants"), was once feared by locals as "the entrance to Hell," not being first explored until 1879 by a man named Anton Posselt. 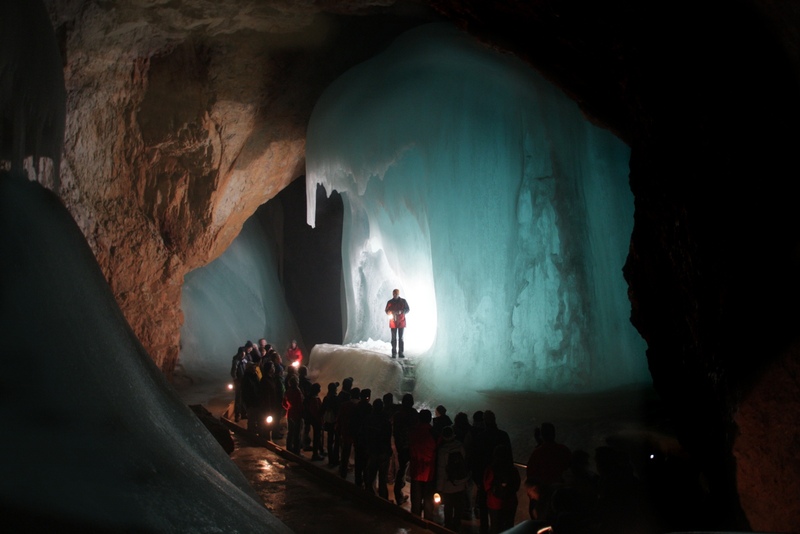 What was Posselt's inspiration for venturing off into this Austrian abyss with little more than a lamp and an ice pick? Maybe a mental disorder, who knows, but we can all thank him for it. 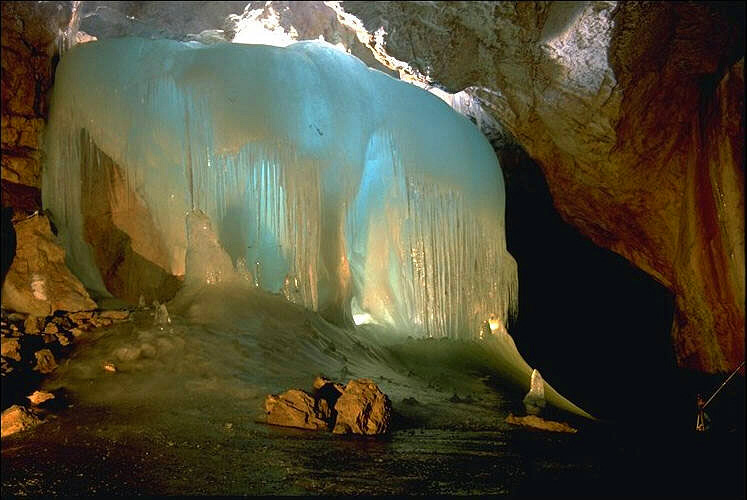 Eisriesenwelt Caves can be reached on the Tauern motorway, on the trunk road from Salzburg or by train. The mountain road up to the parking area, situated at an altitude of 1000 meters, is open for all the vehicles. Local buses are also available from the Werfen village. People who are comfortable walking 5 km can reach on foot also. There are no electronic lights in the cave. One have to guide himself on his own with the help of carbide lamps provided. The cave system is opened for public from 1 May to 26 October from 9:30 am to 3:30 pm. In July and August, it is opened until 4:30 pm. The tour of the cave Eisriesenwelt takes about 4 hours, so it is advisable to dress warmly and wear good boots because it might be slippery. Taking gloves is also a good idea as the railings are covered in ice. Visitors are recommended to sensibly judge their strengths before the tour because the tunnels are narrow and slippery.